In Islamic history the month of Ramadan has been noted for many important events including great battles that brought relief and victory to the Muslim Ummah. 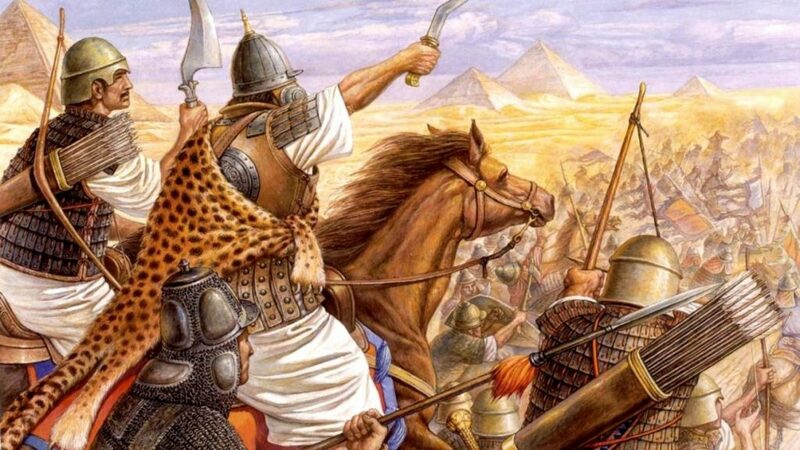 These battles include the great battle of Badr, the conquest of Makkah, The battle of Hittin in Palestine, the battle of Zallaqah in Spain, and the battle of Ain Jalut also in Palestine. In the early thirteenth century of the common era the Muslim world faced a serious threat in the form of the Mongol invasions. At the beginning of that century, Genghis Khan had united the warring Mongol tribes and embarked on a series of conquests in China, Central Asia, Afghanistan, and Russia. He eventually came into contact with the Muslim Khwarizm empire in Persia and Central Asia which was eventually completely defeated and occupied. The Mongols, though skilled warriors, also developed a reputation for great brutality. In many instances they slaughtered enormous numbers of people in the cities that they conquered. Generally the more fiercely a population resisted invasion, the more brutal the Mongol reprisal would be when they were conquered. Genghis Khan died in 1227 CE (Common Era) and he was succeeded by his sons and grandsons who carried on his campaigns. In Persia, his grandson Halaku Khan was made the Mongol leader and he invaded Iraq. In 1258 CE, Baghdad, the capital of the Abbasid Caliphate was attacked and sacked and the last Abbasid Caliph, Al Mutasim, was executed. The Mongols then went on the invade Syria and made it all the way to Palestine. By the time the Mongol armies reached the Levant (Syria, Jordan, Lebanon, and Palestine), their name elicited such fear that many people would surrender to them without a fight even knowing they would die in order to avoid being tormented with an even worse death. The Mamluk Sultan of Egypt at that time, Saifuddin Qutuz, decided to face and fight the Mongols. He lead an army to Palestine with his military commander Baybars, to stop the invasion. The Mamluks were a group of people of slave origin that formed the military elite of the Egyptian kingdom at that time. They came into prominence during the rulership of the descendants of the great Salahuddin Al Ayyubi, and eventually took over the kingship themselves. They were trained from a young age as warriors and were very capable in battle. The Mongol army included the Mongols themselves as well as the army of the Kingdom of Armenia and the Christian Kingdom of Georgia. The two forces met each other at a location in Palestine known at that time as Ain Jalut, which literally means “Spring of Goliath” on the 25 th of Ramadan in 558 Hijri (1260 CE). Both armies were of comparable strength at about twenty thousand soldiers each. The commander of the Mamluk army , Baybars was familiar with the local terrain and took advantage of this knowledge. He hid most of his army among some trees and went out with a smaller force. He engaged the Mongols in some back and forth fighting and eventually pretended to retreat, luring the Mongols into an ambush. At the right moment the bulk of the Mamluk army attacked with their cavalry and volleys of arrows and took the Mongols by surprise. However, the Mongols rallied and fought back fiercely. It is related that in the midst of battle Sultan Qutuz threw down his helmet and urged his soldiers on in the name of Islam. This inspired his troops and they eventually gained the upper hand. Victory was sealed when the the leader of the Mongol army—general Ketbugha– was captured and executed by the Mamluks. This caused the remaining Mongols to retreat. They did stop and attempt to fight again at Beisan but were again defeated. At the end of the battle most of the Mongol army was destroyed and the Mamluks achieved a decisive victory. The Mamluk losses were significant as well. As a result of this battle the Mongol advance was halted and the Muslim world was saved from perhaps total occupation by the Mongols. Indeed it ranks as one of the most decisive battles Muslims fought since the battle of Badr because a loss at Ain Jalut would have meant the loss of Egypt and the Hijaz, including Makkah and Madinah. After this victory, the fortunes of the Muslims improved and Mongols became weaker. Also by the Mercy of Allah, many of the Mongols, including their leaders in the Muslim portion of their empire (Iran and Central Asia) accepted Islam and all of the territories they had conquered from the Muslims were restored under Muslim rule. On the way back to Cairo, Sultan Qutuz was assassinated, and Baybars became the new sultan. It is reported that Baybars may have been behind the conspiracy to kill Qutuz in an unfortunate twist in the aftermath of the battle. Nevertheless Baybars did go on to rule for a number of years and strengthen the Mamluks. He went on to recapture further territory from the Crusaders and the Mongols during his reign. It is worth remembering that this famous battle took place in the sacred month of Ramadan which is a reminder of the great blessings this month brings.